The month of June marked our fourth operational month in the UK and will go down as an epic month in the Group History. 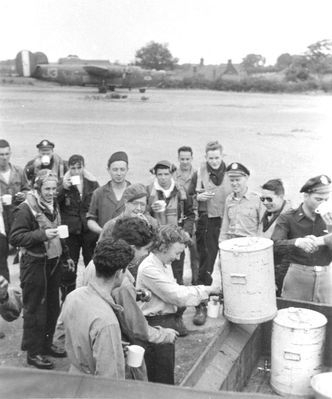 In exactly thirty days the Group flew 30 Sorties, sometimes flying three missions each day, other times landing on the strips and having coffee and food served right at the ships, quickly interrogated, then briefed to go out again. Other crews were preparing to hit other targets, all departments were working overtime, but did we care? No, was it not “The Month”? Day by day we piled up a record we believe will stand with the best in the heavy bombardment league, and we base our statement on the following events. 2 June, alerted and completed our 53rd Sortie in our attack against STELLA PLAGE in the PAS DE CALAIS area, a GUN INSTALLATION whose obliteration would ease landings on “D-Day”. Twenty-two of our A/C were dispatched with all A/C attacking through the aid of PFF equipment due to 10/10ths undercast. 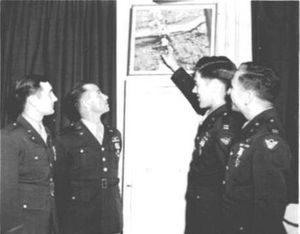 The formation, led by Major HENSON and Major HENSLER dropped 84x2000 GP’s with unobserved results. No fighter opposition was encountered and no flak seen whatsoever. Another day with no abortions and no battle damage suffered. Sortie 54 was completed on 4 June with 23 of our A/C over the target led by Capts. WOODWARD and SLATON. The target assigned and hit was the A/F at BOURGES, FRANCE. Four hundred and seventy one 100 Lb. frag bombs were dropped with good results. No E/A were encountered and meager flak was directed at the formation with ineffective results as no A/C suffered any battle damage. The daily poundings of the coastal area could mean but one event to us, “D-Day”, and it was with sort of a lump-in-the-throat feeling we awaited the alert for 6 June. At last it had come. The day so eagerly awaited by the world, and we were to play an all important part in this tremendous undertaking. It can be said that of the number who knew of the event, not a word was mentioned and security upheld, but the tenseness was felt [that] “Something was up”. We did not expect a rest and therefore were not surprised to be alerted on the 7th to help disrupt transportation facilities and movement to the beachhead of the much needed German materials. Our target, BRIDGES and HIGHWAYS in the city of LISIEUX, FRANCE. 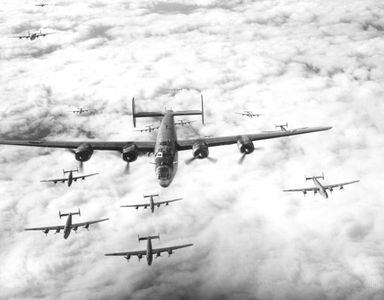 Twelve of our A/C were over the targets led by Capt. OLLUM and deposited 143x500 GP’s with unobserved results due to the 10/10ths undercast dogging the invasion efforts. No A/C nor flak encountered, and Sortie 59 chalked up on the sortie board. 8 June found us still plugging, chalking up Sortie 60 by attacking a three-span bridge over the River La Selune in PONTABAULT, FRANCE. Twenty-one of our A/C led by Col. ISBELL and Capt. FREEMAN dropped 119x1000 GP’s on the target with unobserved results as the undercast interfered over the target necessitating GH bombing. No flak or E/A were encountered. 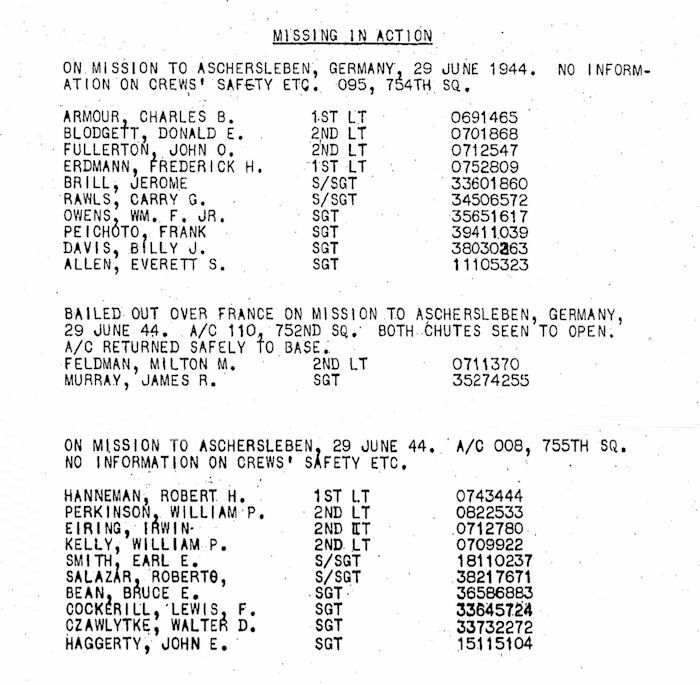 After a day of rest, we were again alerted on the 10th, the target assigned was the A/F at CHATEAUDUN, FRANCE. 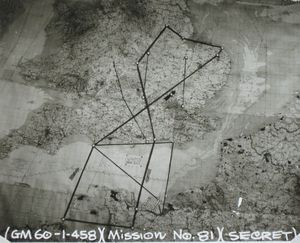 The purpose of the attack being to knock out serviceability of the airfield so that our fighters could later attack E/A confined to the dispersal areas. Twenty-two of our A/C were over the target led by Lt. Col. FEILING and Capt. BOOTH [and] dropped 502x250 GP’s on the target with the aid of PFF equipment as there was a solid undercast over the Continent. Bombing results were unobserved. No E/A were encountered and the flak thrown up was light. None of our A/C suffered battle damage. On June 11, we chalked up Sortie 62 and 63 and earned a citation for the work done by attacking an important bridge at BLOIS, FRANCE (See attached Order HQ, VIII AF #466, 12 July 44 for Citation) [this citation is missing from group records]. Our second section attacked the A/F at BEAUVAIS/NEVILLERS with good to excellent results on the RR bridge our formation of 12 A/C was dispatched with seven attacking and dropping 21x2000 GP’s on the target. The first formation was led by Capt. OLLUM (standing at left in photo). Photo recon shows the damage to this bridge as follows, “2,000 Lb. bombs scored near misses on the approaches and the bridge proper. Oblique photos show that the main span has been broken and is in the river bottom”. [See Lt Joseph McCollough Crew page for details] Of the 12 A/C dispatched on the second mission, 9 A/C attacked under the leadership of Capt. CHAMBERLAIN and dropped 168x250 GP’s on target and 48x250 GP’s on other targets of opportunity. No fighter opposition was encountered and one of our A/C was the only casualty suffering minor battle damage. On 12 June we dispatched one of our largest formations of 36 A/C led by Major JAMISON, Capts. HINCKLEY and FREEMAN. We were credited with 35 individual sorties this day, but only 33 of our A/C attacked the target, EVREAUX/FAUVILLE, FRANCE. Our purpose this day was to keep the Luftwaffe out of the air. We believe we accomplished our mission by dropping 357 M1 incendiary clusters, 24x250 GP’s long delayed fuses and 504x250 GP’s with excellent results. Another day without seeing any Jerry fighters and the only battle damage suffered was minor battle damage to three of our A/C. We had a day of rest on the 13th, but the 14th saw us out again in force, chalking up Sortie 65 by attacking a NOBALL INSTALLATION at DOMLEGER. Thirty-four of our A/C were over the target led by Major HENSLER, Capt. HINCKLEY and Major WILLIAMSON. 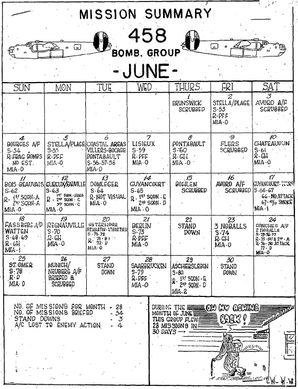 Bombs dropped this day: 305x500 GP’s on Primary and 96x500 on a Target of Opportunity, with results classified as “Good”. Again we were fighter free and seven of our A/C returned with minor flak damage. On 15 June we dispatched 23 A/C led by Lt. Col. FEILING and Major WILLIAMSON, to attack the A/F at GUYANCOURT, FRANCE. Twenty-three of our A/C were over the target dropping 898x100 Lb. GP’s, with a good concentration on the SE perimeter and servicing area. It was the same old story, “No E/A encountered”, and three of our A/C suffering flak damage, two as minor and one major. Thus Sortie 66 went up on the board. Poor old GUYANCOURT was to take it again on the 17th, giving us another notch on the sortie board with No. 67 credited. The Lord must have thought Guyancourt had suffered enough on the 15th, so gave it a respite by having 10/10ths clouds protecting it, so our formation did not drop any bombs on the field. However, it was not to be a non-bombing mission as two of our A/C bombed ST. VALERY A/D and DREUX, M/Y with unobserved results. It’s getting monotonous mentioning this, but it should be noted that no E/A was encountered and no flak damage suffered. Our afternoon mission saw 10 A/C dispatched under the leadership of Capt. FREEMAN to attack a NOBALL at WATTEN. Nine of our A/C were over the target dropping 32x2000 GP’s with the aid of PFF equipment. No E/A encountered and the route was flak free. Sorties 71 and 72 went up on the board on 19 June after our two attacks during the day on REGNAUVILLE, FRANCE where our two targets were a NOBALL INSTALLATION and a GIRDER BRIDGE at SAMMUR. The destruction of these two targets would complete the program initiated for this general area. On the installation, eleven of our A/C were over the target led by Capt, BOOTH and dropping 538x100 GP’s with unobserved results due to 10/10ths cloud coverage. On the bridge and adjoining installations, ten of our A/C were over the target led by Capt. HINCKLEY and the 520x100 GP’s dropped with the aid of GH equipment with unobserved results. No enemy A/C were encountered, but eleven of our A/C suffered flak damage having been subjected to heavy guns during the entire time from the I.P. to the target. 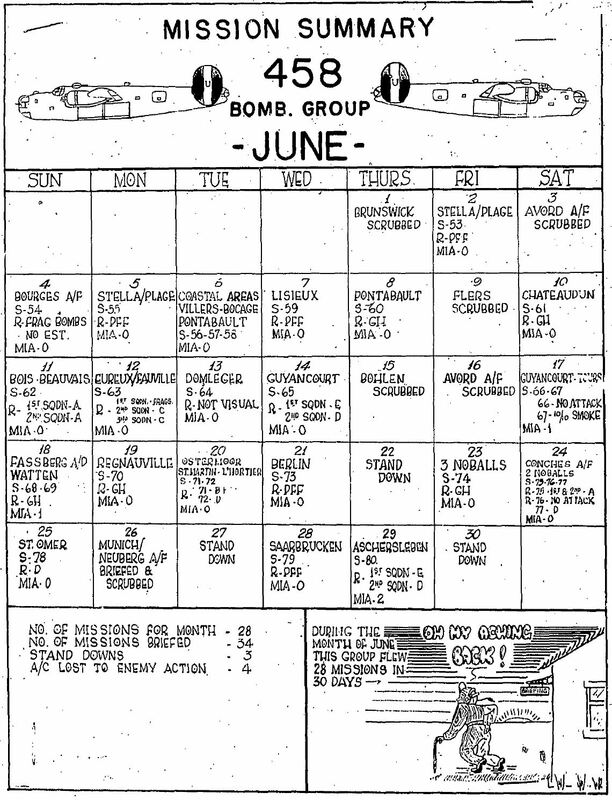 On June 20, a formation of 9 A/C were dispatched to attack a NOBALL INSTALLATION in FRANCE, but due to 10/10ths coverage no bombs were dropped and no sortie credit awarded. However, we were going “Hell bent for leather” so in the PM, we sent out two more formations, one to attack the MINERALOL WORKS at OSTERMOOR, GERMANY, and the other NOBALL supply site 1/2 mile west of the village of ST. MARTIN L’HORTIER in FRANCE. Col. ISBELL led our 22 A/C over OSTMOOR with the following results: First Section, 12 A/C dropped visually and SAV’s show good concentration on assigned MPI. Second Section, bombed visually, SAV’s show MPI concealed by smoke with no bursts visible outside smoke area. Six A/C led by Lt. HAYDON were over the NOBALL INSTALLATION dropping 72x500 GP’s with unobserved results. All six A/C suffered flak damage, but did not observe any enemy fighters. Sorties 73 and 74 were added to our growing sortie credit. On June 21, the GENSHAGEN, DAIMLER ENGINE WORKS just south of the city of BERLIN was to be our objective on our objective on our 75th Sortie. Twenty of our A/C were over the target led by Col. FEILING and Major HENSON [placing] 168x500 GP’s on the target with fair results. No E/A encountered by this Group and but six of our A/C suffered minor battle damage. After a day of rest we were again alerted on the 23rd, our targets for the day being 3 NOBALL construction works in the PAS DE CALAIS area. Of the 31 A/C dispatched, 29 were over the targets led by Major WILLIAMSON, and Capts. HINCKLEY and CHAMBERLAIN. Due to the 10/10ths undercast, PFF technique was employed and 526x250 GP’s were dropped on these important installations with unobserved results. No E/A encountered and flak was encountered at one of the targets administering minor battle damage to one of our A/C. Sortie #76 was chalked up on the board. Another three sortie day fell as our lot on 24 June as we chalked up Sorties 77, 78, and 79. In the morning our formations of 23 A/C were dispatched under the leadership of Majors HENSLER and JAMISON, with 21 A/C attacking the target, CONCHES A/F in FRANCE, and dropping 229x500 GP’s with good results. No E/A encountered and two of our A/C suffered minor battle damage. 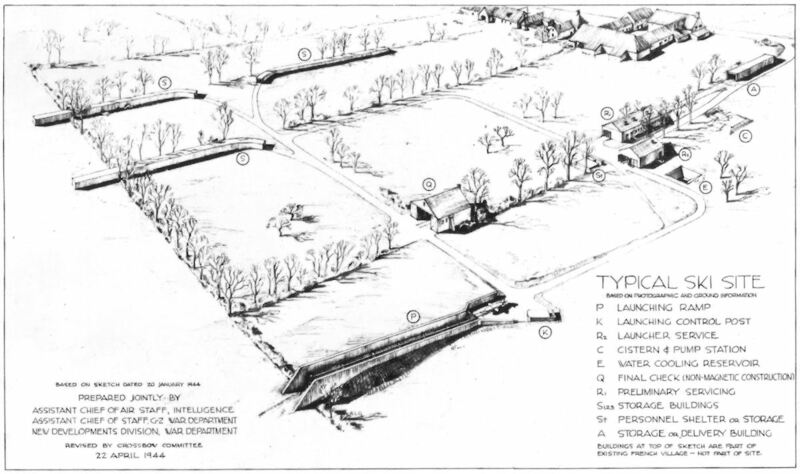 In the PM, a formation of 10 A/C were dispatched to attack a NOBALL INSTALLATION 6 miles south of St. OMER, FRANCE. However, although we flew over the target, the 10/10ths clouds prevailing forced us to abandon bombing as the target was near built up French Territory. However, credit for a sortie was awarded our efforts. The weather section must have received some information relative to a break in the clouds over the same NOBALL, as six of our A/C were dispatched later on in the afternoon to accomplish that intended in the earlier mission. Five A/C were over the target led by Capt. BOOTH dropping 80x250 GP’s and 12x250 long delayed fused bombs with poor results. 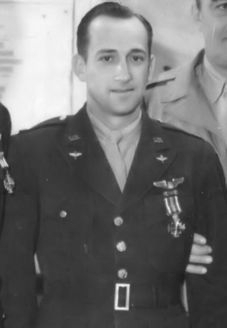 Our A/C 219 [F/O Harold A. Walker], was hit by flak before reaching the target and had to jettison his bombs and return with two members of his crew injured. On 25 June, Sortie #80 was chalked up as the result of our attacking ST. OMER and three Targets of Opportunity. Our formation of 24 A/C dispatched with 22 sortie credits and 21 A/C actually attacking was under the leadership of Lt. Col. HOGG. A total of 217x500 GP’s were dropped on the targets with results from unobserved to fair. Although no E/A was encountered, the flak was heavy, inflicting minor battle damage to 14 of our A/C. A deep penetration was set for our 81st Sortie [on June 28] and the target chosen for the day, the M/Y at SAARBRUCKEN. 33 of our A/C attacked under the leadership of Major LA ROCHE (left) and Capt. CHAMBERLAIN dropping 644x250 GP’s with the following results. “SAV show that attack was in the target area, but clouds obscured the bursts. Crews from all three squadrons report a few fires and hits in general target area. If the is a Luftwaffe, this Group does not seem to know it. Over the target, the AA was intense and accurate inflicting minor battle damage to 16 of our A/C. No A/C were lost and the fighter support was excellent. It is interesting to note that in 30 sorties flown over the Continent and deep into Germany, not one single E/A was encountered.